It’s never been easy to be a police officer and in the past few months, it’s seemed even more challenging. That’s why it’s refreshing to see officers making a difference by going above and beyond the call of duty to change lives. “I was in an abusive relationship for 10 years, finally got out of the situation,” Jennifer Montierth said. She and her kids ended up at 59th Avenue and Northern, panhandling after getting evicted. One day, a Glendale police officer pulled up. “I was scared, I thought I was going to get a ticket or arrested or something,” Montierth said. Instead, Montierth said the officer got to work to help turn their lives around. The officer struck a deal with an apartment complex; they could stay as long as Jennifer cleaned vacant units. Several churches stepped in to pay for rent and household goods. “She saw we were having problems and she really wanted to help,” Montierth said. “There was just something about this family,” officer LeeAnn Johnson said. She even dipped into her own pockets to pay for a hotel for the family at first and tried finding Montierth a job. Then, her squad joined in. 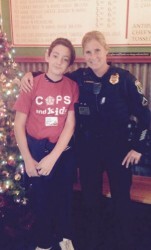 Though Johnson has been named “Officer of the Month,” to Montierth’s family, she’s a lifelong saving grace. “This is part of our duty – it’s not just to go out and arrest people, it’s to help people,” Johnson said. Montierth starts a new job Monday. Johnson said she’ll keep checking in with them to make sure they have everything they need. “She’s our angel, she saved us,” Montierth said.